I’ve been on a kick for finding healthy lunch recipes that I can make ahead of time to bring to work and today’s recipe is a new addition to the rotation. I love sweet potatoes. My husband is not as much of fan as me so if you’re like him, then feel free to use a regular baked potato instead. It’ll still be super tasty, I promise. I’m not into eating meat lately, so this is a wonderful vegetarian option. It also happens to be “healthy.” I use quotations because everyone has their own definition of what’s healthy. 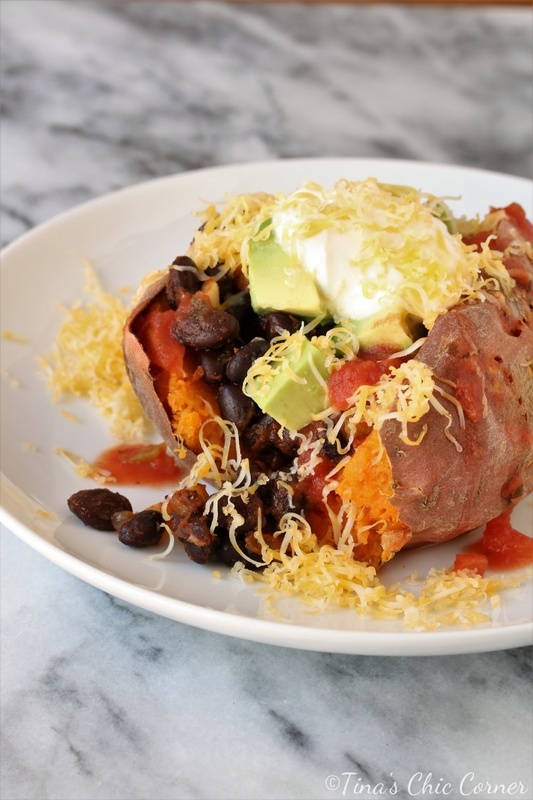 I consider this baked potato healthy for me because I cut corners on fat and calories. For example, I used low fat cheese (instead of full fat cheese), no fat yogurt (instead of sour cream), and only used a few pieces of avocado (even though the fat is the healthy kind). Keep in mind that if you decide to switch up your toppings then it may not be as healthy an option as this version. For example, you could add taco flavored beef, a whole bunch of guacamole, tortilla chips, or… well, I’m sure that you get the point. In fairness, you could also make my version healthier. Either way, I just wanted to mention that in case it was important to you. I have to say that this bean mixture is out of this world delicious and I think it is the highlight of this dish. 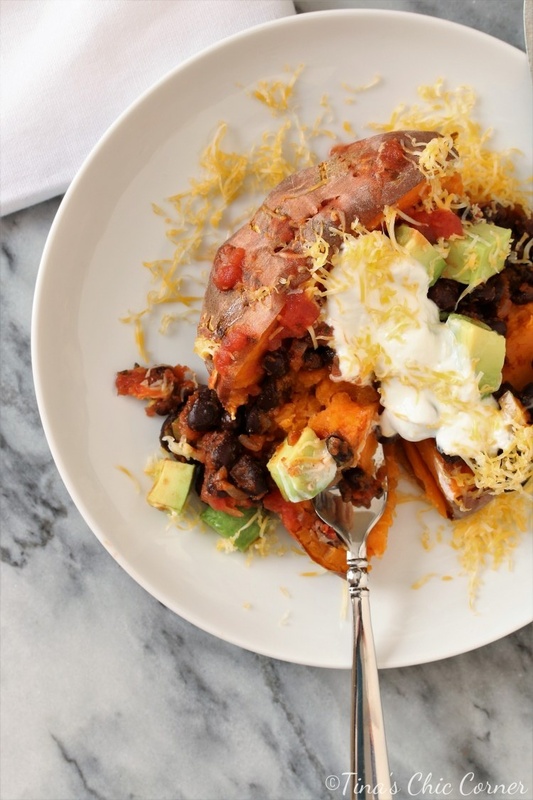 Even though I adore sweet potatoes, they can be a bit boring, and these beans give it life. In fact, my husband took some of the leftover beans and ate it with rice and veggies for dinner. It looked delicious and I love that he was able to create something entirely different with some of the left over ingredients from this recipe. Preheat the oven to 425 degrees F. Line a baking sheet with tin foil and set it aside. Very sticky liquid may drip from the sweet potatoes so the foil will help make clean up a breeze. Pierce the sweet potatoes with a fork several times all around each one. Place the sweet potatoes on the prepared baking sheet and bake them for 45 minutes to 1 hour. 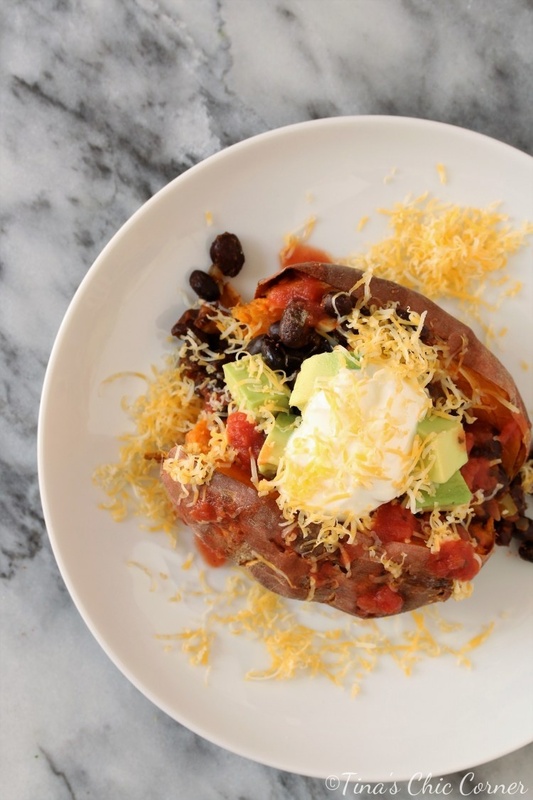 The timing really depends on the size of your sweet potatoes. To test whether they are done, carefully (and without burning yourself) stick a fork in each one and if it’s tender then it’s done, or if you think it’s close but you can’t tell, slice it open to get a better gauge. While the sweet potatoes are baking, heat a skillet over medium heat on the stove. Lightly spray the skilled with cooking spray. Add the diced onion and cook until it’s tender. Add the garlic, cumin, coriander, and chili powder and stir to coat the onions. Cook for about 1 minute. Add the black beans and tomato sauce and cook it for about 5 to 8 minutes or until the liquid has soaked in. Time to build the sweet potatoes!